"All Sanctum Sanctorum for the main and sub-deities have now been completed. The presiding deities are Sri Ram Parivar and the sub-deities are Sri Ganapathi, Sri Siva, Sri Durga/Parvathi, Sri Karthikeya, Sri Hanuman, Sri Radhakrishna, Sri Lakshmi, Sri Venkateswara, Sri Saraswathi, Sri Ayyappa, Sri Mahavira, Navagrahas and Shiva Linga. 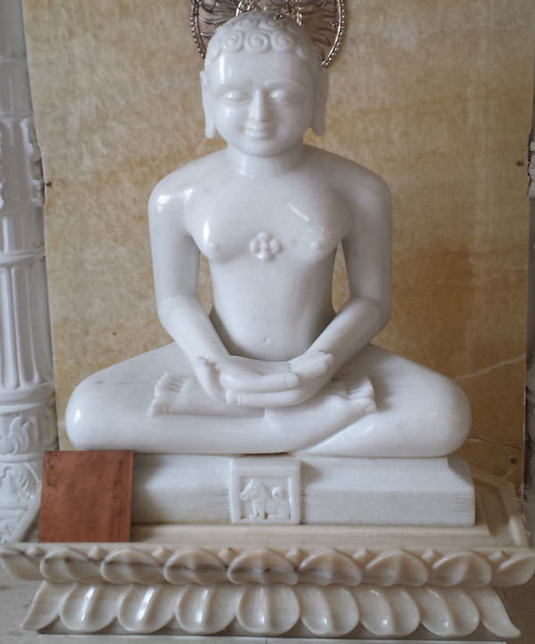 Ram Parivar made of white marble was donated to the temple by Shri Gulab Kothari, Editor and Managing Director of Rajasthan Patrika, Jaipur. 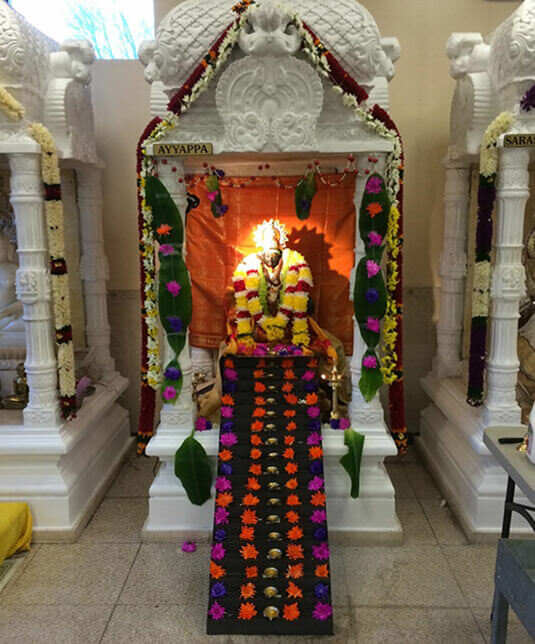 Prana Pratishta of the Navagrahas and the Siva Linga has been completed." Rama is the seventh avatar of the Hindu god Vishnu, and a king of Ayodhya. Rama is also the protagonist of the Hindu epic Ramayana, which narrates his supremacy. Rama is one of the many popular figures and deities in Hinduism, specifically Vaishnavism and Vaishnava religious scriptures in South and Southeast Asia. 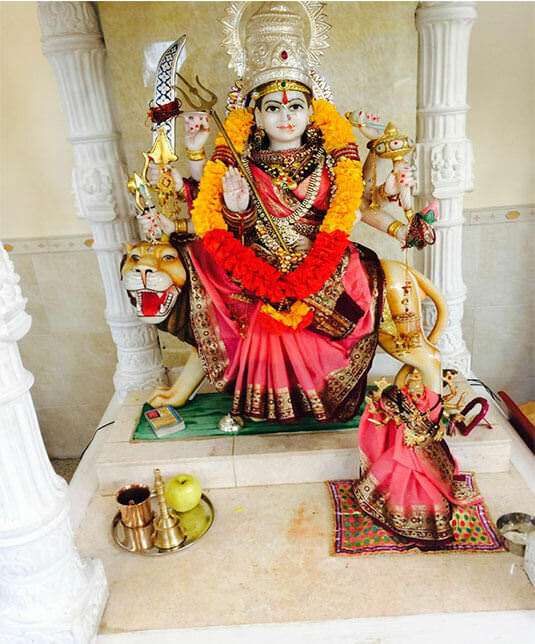 Durga is the original manifested form of Mother Parvati or Adi-Parashakti. Durga is Adi-Parashakti herself. The Devi Gita, declares her to be the greatest Goddess. Saraswati is the Hindu goddess of knowledge, music, arts, wisdom and learning.She is a part of the trinity of Saraswati, Lakshmi and Parvati. All the three forms help the trinity of Brahma, Vishnu and Shiva to create, maintain and regenerate-recycle the Universe respectively. Shiva, also known as Mahadeva ("Great God"), is a popular Hindu deity. Shiva is regarded as one of the primary forms of God. He is the Supreme God within Shaivism, one of the three most influential denominations in contemporary Hinduism. Ganesha also known as Ganapati and Vinayaka, is one of the best-known and most worshipped deities in the Hindu pantheon. His image is found throughout India. Hindu sects worship him regardless of affiliations. Hanuman is a Hindu god and an ardent devotee of Rama. He is a central character in the Indian epic Ramayana and its various versions. He also finds mentions in several other texts, including Mahabharata, the various Puranas and some Jain texts. Lakshmi is the Hindu goddess of wealth, love, prosperity (both material and spiritual), fortune, and the embodiment of beauty. She is the wife and active energy of Vishnu. The lingam (also linga, ling, Shiva linga, Shiv ling)is a representation of the Hindu deity Shiva used for worship in temples. In traditional Indian society, the linga is rather seen as a symbol of the energy and potential of God, Shiva himself. Subramaniyan is the Hindu god of war. He is the commander-in-chief of the army of the devas (gods) and the son of Shiva and Parvati.Murugan is worshiped primarily in areas with Tamil influences, especially South India, Sri Lanka, Mauritius, Indonesia, Malaysia, Singapore and Reunion Island. 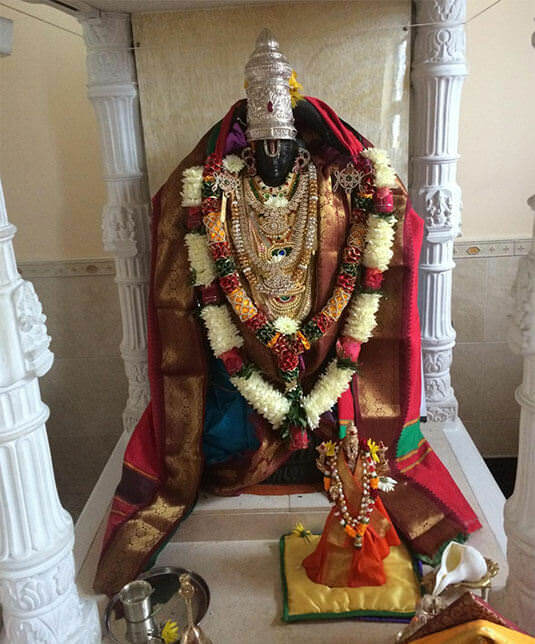 Venkateswara also known as Srinivasa, Balaji, Venkata, and Venkatacalapati, is a form of the Hindu god Vishnu. 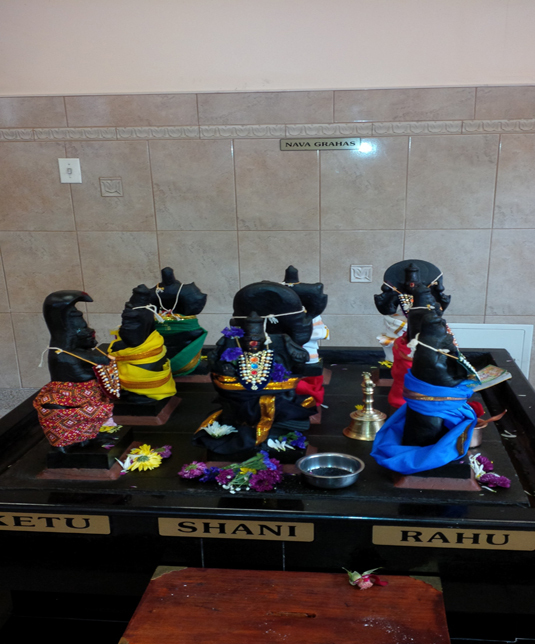 Navagrahas are deities in Hindu belief, and Hindu astrology. There are nine Navagraha. They include the Sun; the Moon; the planets Mars, Mercury, Jupiter, Venus, and Saturn; and the ascending and descending lunar nodes, respectively known as Rahu and Ketu. Lord Mahavir is believed to be the founder of Jainism which is rooted in the principles of non-violence, truthfulness, nonattachment, chastity and non-stealing as the sure way to escape samsara (the cycle of birth and death). He was born in the year 599 B.C. as the son of a king with all the comforts of life. Staten Island is one of the five boroughs of the New York City, famous for more than 170 parks and known as “Greenest Borough” is an ideal place for contemplation. The proximity of the Island to other boroughs of New York City as well as State of New Jersey make it all the more suitable for immigrants from all over to call it home. During the 1970 to 1980 the population of Hindus grew at a faster pace on the island, and continue to grow. To fulfill their spiritual needs, Hindus congregated in various family rooms to participate in prayers, spiritual discourses by visiting scholars. To follow the age-old tradition of worship (Iswar Puja), listening (sravana), faith (aastha), and japa (chanting of Vedic hymns), necessity of building a place of Hindu worship became evident. 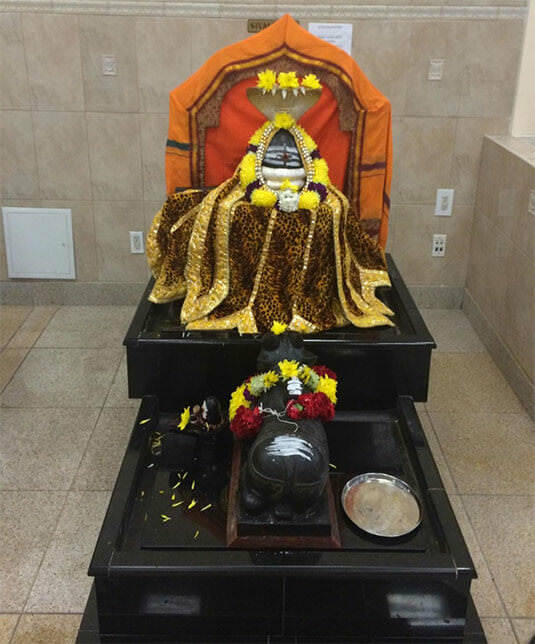 An organization namely, Staten Island Hindu Temple, Inc was registered with the State of New York in 1997. There was a consensus to name the temple after ​Shree R​ama. This led to the purchase of property at 1318 Victory Blvd. Staten Island, in June 2001 with the intent to build the temple by replacing the existing structure. The congregation of Hindus consecrated the new temple structure with Hindu religious invocations (bhoomi puja) by priests in 2004. Construction of the temple began making the dream a reality. Construction was completed in 2006. Inauguration of the temple premises, the house of God (Devalaya) took place with worship according to Hindu rituals of temple entry (devalaya pravesana) thereafter. 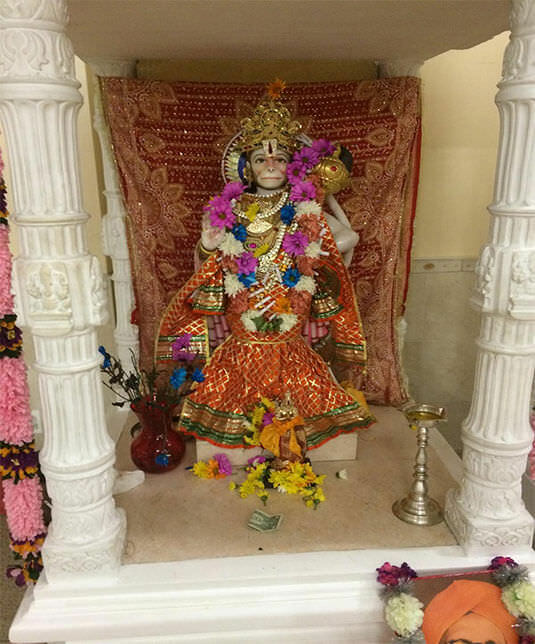 Various Hindu deities were included inside the temple premises as per the wishes of different denominations of the Hindus with different cultures and traditions thereby reflecting a harmonious and peaceful confluence of all traditions of devotees. The marble and granite deities from India were located as per the temple architect. Prana Pratishta (consecration of idols) for ​ Lord ​ Ganesha, Ram Parivar and Venkateswara was performed in August 2007, followed by Ayyappa in November 2007, and then Siva-Parvati, Durga ​Devi ​, Lakshmi Devi, Saraswati Devi, Radha-Krishna, Subramanya and Hanuman in 2008. A Jain priest performed Prana Pratista for Mahavir in 2009. Finally ​, ​in 2010 Prana Pratishta Mahotsavam was performed for Siva Linga along with Navagrahas on a grand scale. Construction was ​thus ​ completed and the ​dream ​of the devotees fulfilled. ​The ​ temple is serving all the spiritual needs of the Asian Indian American Community for generations to come. The Community hall annex is a vital part of the temple to facilitate music, dance and language classes. Purna Vidya classes are held every Sunday. Temple also participates in Community Days and Interfaith activities including organizing health seminars, collecting and distributing clothes and canned food ​to the needy​. Various cultural events take place in the community hall on a ​regular basis. Greetings from our great Temple for a Happy, Healthy and Blessed 2019! As your Chairman I would like to thank all the temple devotees for their continued support and participation in all of the functions we conduct throughout the year. Especially this year special mention is made for the tremendous outpouring of financial support for the Temple Gopuram project. Also, please, mark your calendar 2nd, 3rd and 4th of August, 2019 for participation in the Temple Kumbhabhishkam. We have been celebrating all the Hindu festivals, and not a single month passes without a festival being included. On behalf of the Board of Trustees I thank you all for a good year, and hope you will continue the same in the future. The many volunteers whose selfless service keeps the Temple going the way it does cannot be appreciated enough. As usual the year started with Maha Ganapati pooja and Sarva Devata Homam in the morning and Mata ki chowki in the evening. Also we had Sri Ayyappa Irumudi pooja and Pongal celebration. 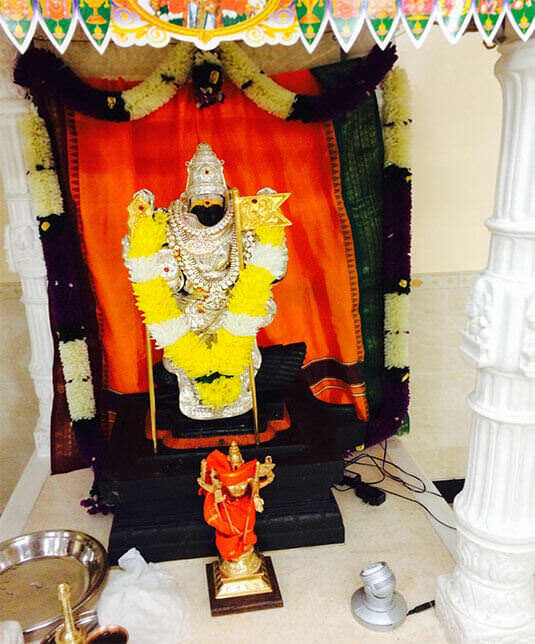 In the month of February we had Vasantha Panchami,and Thaipoosam. 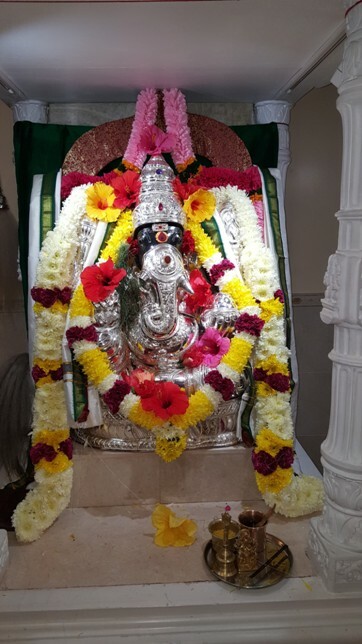 In the month of March we had Mahasivarathri Pooja concluding with Siva-Parvathy Kalyanam and the Temple was open till midnight. Chandramana Yugadi , Holi celebrations, Panguni Utharam and Hanuman Jayanthi were also the highlights of March. 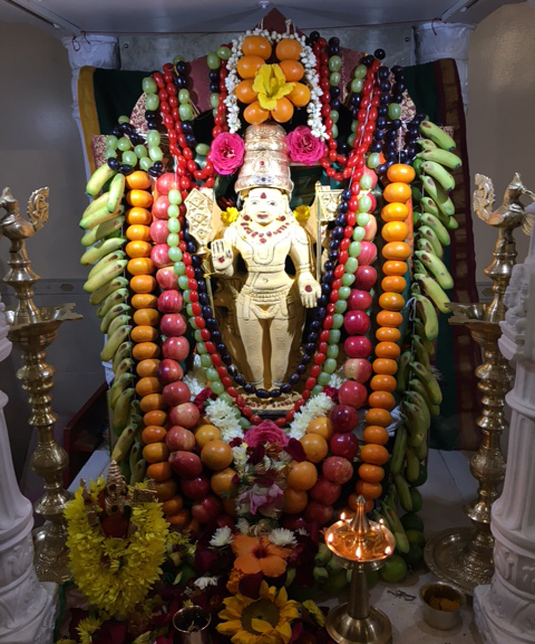 April events included Tamil New Year, Vishu, Vilambinama Souramana Yugadi,Narasimha Jayanthi, and Sri Satyanaraya Kalyana Utsavam. In the month of May Shani Trayodasi Pooja and Vaikashi Visakam along wth the Community Days Health Seminar. Can collectkon for the soup kitchen and clothes distribution were also included as paet of the Interfaith events. In the month of June,Venkateshwara Brahmotsavam, Bhagawat Gita chanting by kids, samskritham workshop and the 21st International yoga day observance. July-Maha Mruthyunjaya Homam Adhyatma Ramayana Parayanam, and voluteers appreciation day. 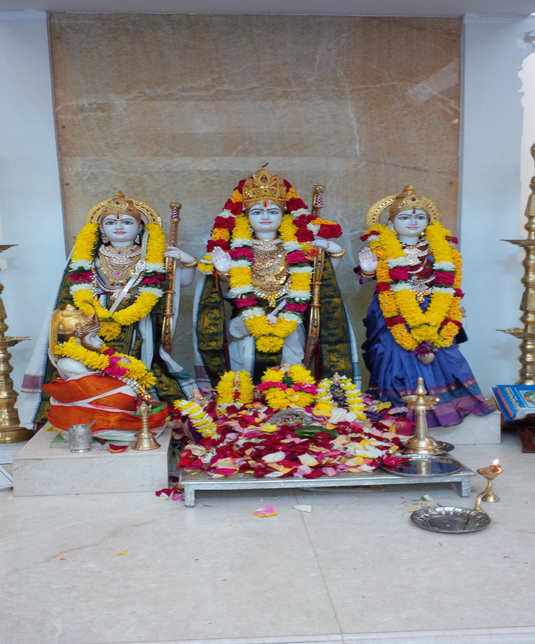 August- Aadipuram, Nalloor kanthan and Varalakshmi utsavam along with Temple anniversary. 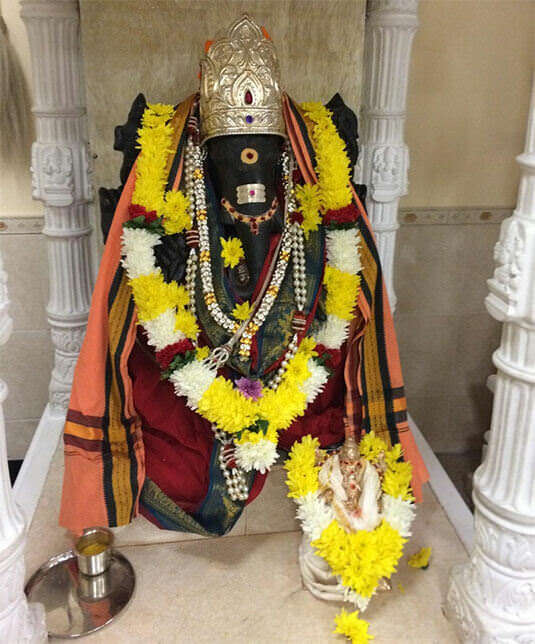 September-Krishna Janmashtami, Ganesha Chathurthi. 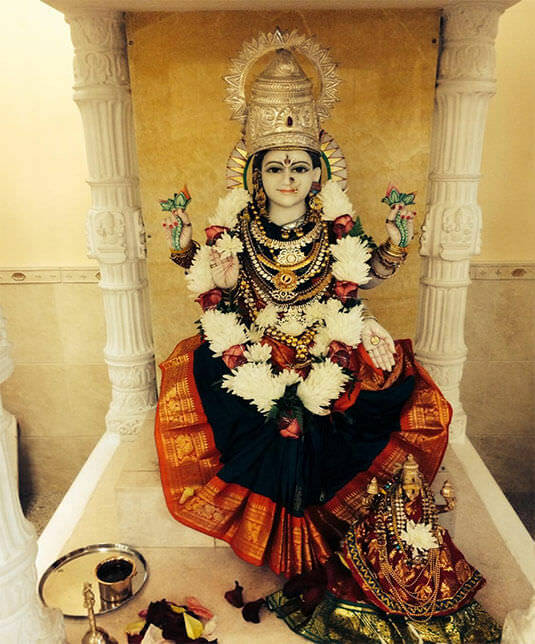 October-Navarathri celebratons with golu display and Chandi Homam. 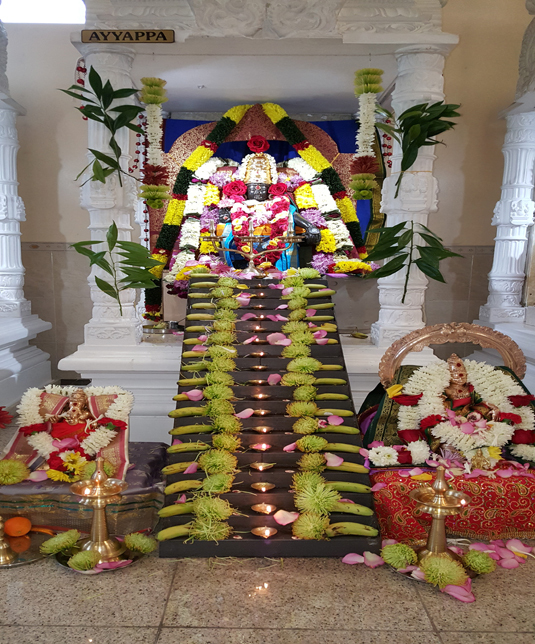 November- Kedaswara pooja followed by Deepavali and Skantha Shashti utsavam and Sri Subramaniya Kalyanam. Ayyappa Mandala Vratham started with Ayyappa Suprabhatham chanting and bhajans every Saturday till January. 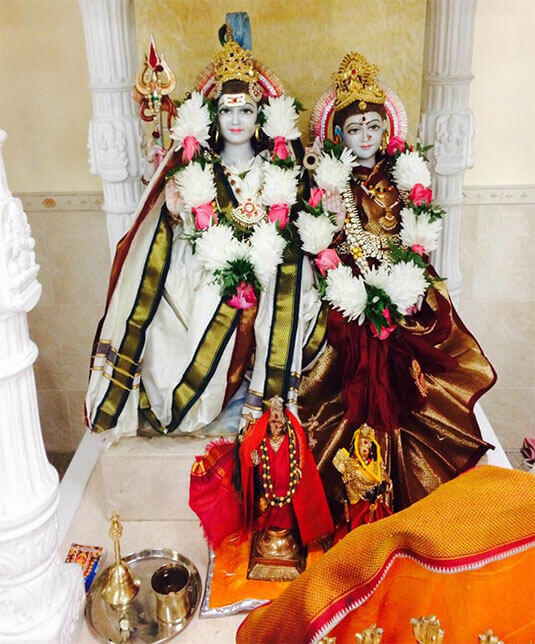 December-Sri Vaikunta Ekadashi and Hauman Jayanthi. Devotees may sponsor annually for Sri Satyanarayana pooja on pournami days, Sri Ayyappa pooja every third Saturday evening, and Pradosha pooja. 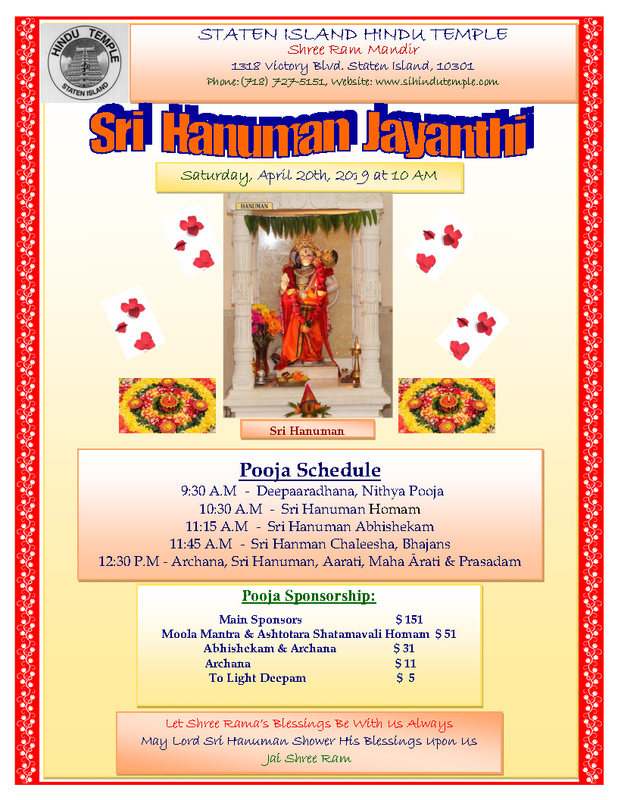 Sponsorship forms are available in the Temple and on the temple website at "www.sihindutemple.com". There are on going children’s religion classes (Purna Vidya) every Sunday evening, music and Bhajan classes on Friday evenings and dance classes on Saturdays. You may contact the Temple for more information regarding these. I wish you all a very happy, prosperous and safe year 2019. 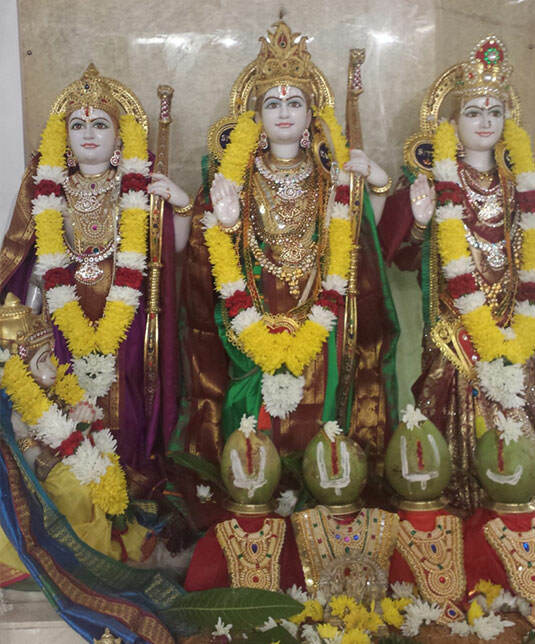 This great Temple of ours depends on you continued support and generous contributions. 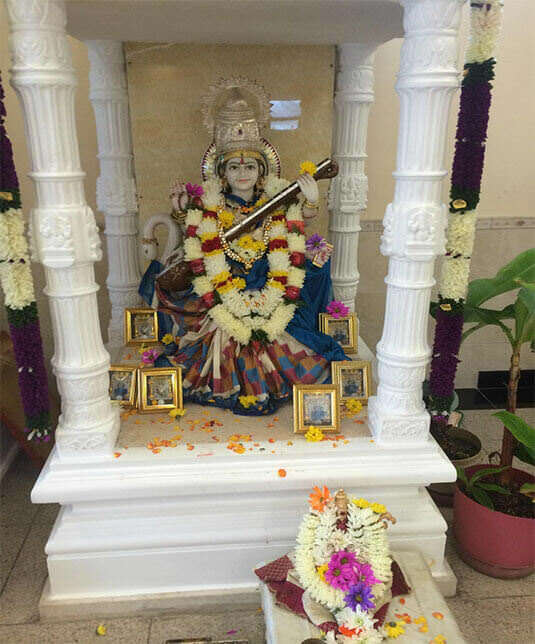 Temple donations can be made using credit card or paypal account online via temple's official website 'www.sihidutemple.com' by clicking Donate link. With blessings from Lord Rama. 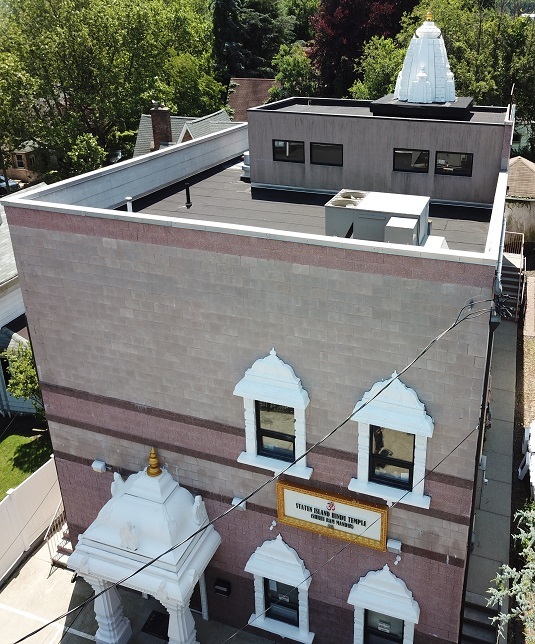 © 2017 Hindu Temple - Staten Island, All Rights Reservered.